Description: The Little People Neighborhood is a red and yellow house that opens to reveal two house halves divided by a tree house. 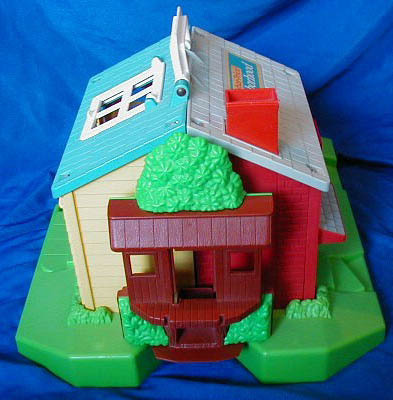 The house is mounted on a green "yard" base. The Neighborhood was sold with a family of 5 (including the dog), and lots of furniture and accessories. 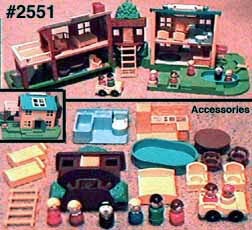 This set features several exclusive pieces, including a modular kitchen unit and a modular bathroom unit, an oval-shaped swimming pool, a full-size bed with a quilted imprint, two twin beds with teddy bear imprints, the treehouse, the yellow treehouse door, and yellow ladder that leads up to the treehouse. 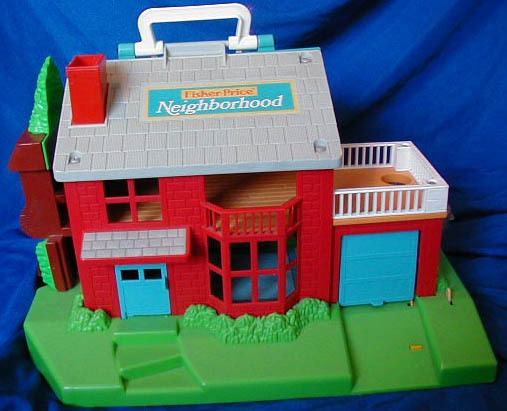 The most hard-to-find pieces from this set are the treehouse, the removable treehouse door and the treehouse ladder. 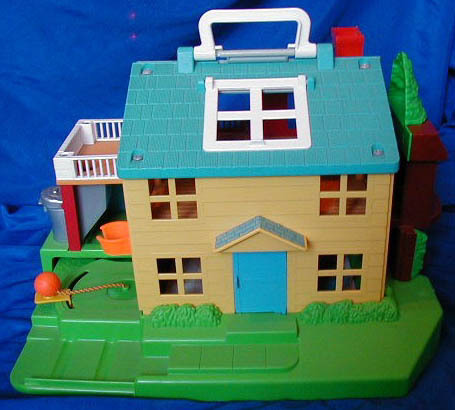 B2551A - Yellow house half with a blue roof, a white hinged carry handle on top of the roof, and a large green plastic base and "yard". B2551B - Red house half with a gray roof, red chimney, and a large green plastic base with a small "front yard". FPT1094 - Brown plastic treehouse "connector" pieces joins the two base sections of the Neighborhood playset (items #B2551A/B2551B). Has door way (yellow door is SEPARATE PIECE listed below). FPT1095 - Yellow wood-simulated swinging treehouse door door that fits into the FPT1094 treehouse doorway. The door has "Keep Out" on the front. Sold as a separate piece only. FPT63 - Light blue one-piece plastic bathroom unit that has a sink, toilet, tub, and tiled floor molded together. The toilet has white lid that is hinged and lifts up. FPT62 - Orange modular kitchen unit with a L-shaped counter top, a built-in refrigerator, stove, oven, sink, and cabinets. FPT312 - White squared plastic double bed with no foam padding. Opposed to foam, this bed has a molded QUILTED PATTERN imprint. The bed has a raised rounded headboard and footboard and small legs on the bottom corners. Measures 2-3/4" long x 2-9/16" wide x 3/4" tall. *See "Variations" below. 2 each - FPT1442 - light blue rectangular plastic single bed with No foam. Has a TEDDY BEAR PATTERN imprint on the bed. *See "Variations" below. FPT177 - Yellow "stuffed" 1-seat armchair. FPT199 - Round brown table with NO LITHO on the flat top surface. 2 each - FPT137 - Small medium brown plastic single-seat captain chair that has TRIANGLE mark on back. *See "Variations" below. FPT257 - Yellow 5-rung ladder. FPT26 - Turquoise oval-shaped wading pool. The outside edges of the pool have slightly recessed groves to resemble side support walls. This pool fits within an oval area on the green base of the B2551A - Yellow house half. FPT627 - Yellow top, yellow base 2-seat car (front-to-back seats) with slightly raised "fins" on both sides of the back seat. The car has a gas hole on the back corner, has a tow hook hole under the front bumper, and is marked "©1969-1987 FISHER-PRICE" on the bottom of the car. The car rolls on 4 black smooth rolling wheels with metal axles. The wheels are NOT marked "Fisher-Price Toys". CJPP - Green dad with black molded plastic hair. GEPP - Light red girl with a dark brown plastic sculpted bob. *See "Variations" below. HWPP - Black dog with a red collar. The collar has lines on the outside edges. FPT62 - Yellow modular kitchen unit with a L-shaped counter top, a built-in refrigerator, stove, oven, sink, and cabinets. FPT126 - Yellow squared plastic double bed with no foam padding. Opposed to foam, this bed has a molded QUILTED PATTERN imprint. The bed has a raised rounded headboard and footboard and small legs on the bottom corners. Size: 2-3/4" long x 2-9/16" wide x 3/4" tall. *See "Variations" below. FPT170 - Turquoise Blue "stuffed" 1-seat armchair. FPT211 - Round yellow table with NO LITHO on the flat top surface. 2 each - FPT137 - Small medium brown plastic single-seat captain chair that has TRIANGLE mark on back. GJPP - Red mom with fancy eyes, a blonde ponytail, and wearing eyeglasses. EZPP - Yellow boy with brown molded plastic hair. GCPP - Red girl with a blonde plastic sculpted bob. *See "Variations" below. GLPP - The red girl with a brown sculpted bob could also have a dark red body opposed to light red. This set was sold in a 20-1/8" long, 16-1/8" high, 10-1/2" deep box.